This IBM Redbooks publication is the seventh update (eighth edition) to the best-selling IBM Magstar VTS Implementation Guide, which was first published in 1997. Since the first VTS installations in May 1997, much has changed in the Virtual Tape Server area. The performance, capacity, and functionality of the VTS has been phenomenally enhanced. The focus of this book is to provide implementation and usage guidance for the latest changes to the IBM TotalStorage Enterprise Automated Tape Library VTS models B10 and B20. Minor additions and corrections have also been applied throughout the book. If you discuss, sell, order, or plan for a Virtual Tape Server, please consult this book first! 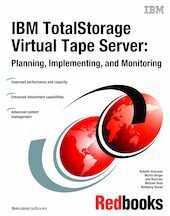 The IBM TotalStorage Virtual Tape Server (VTS) is integrated with the 3494 Tape Library and with the IBM 3584 Tape Library using the IBM 3953 Library Manager. The host system perceives it as an IBM Tape Library with up to 256 virtual 3490E tape drives and up to 500,000 virtual 3490E cartridges, which can have an uncompressed capacity of 400, 800, 1000, 2000, or 4000 MB. The VTS fully exploits the capability of the IBM TotalStorage 3590 and 3592 tape drives and the capacity of their media. The VTS introduced the virtual concept into tape subsystems, similar to virtual storage and virtual disk concepts that already have been implemented. The latest changes allow IBM 3592 Tape Drives to attach to the VTS installed with an IBM 3584 Tape Library, thus enhancing the VTS attachment options and performance once again.